We are pleased to announce that we have in our shop a range of 5 shaving soaps handmade in Finland. First finish shaving products we have ever offered at G&C. 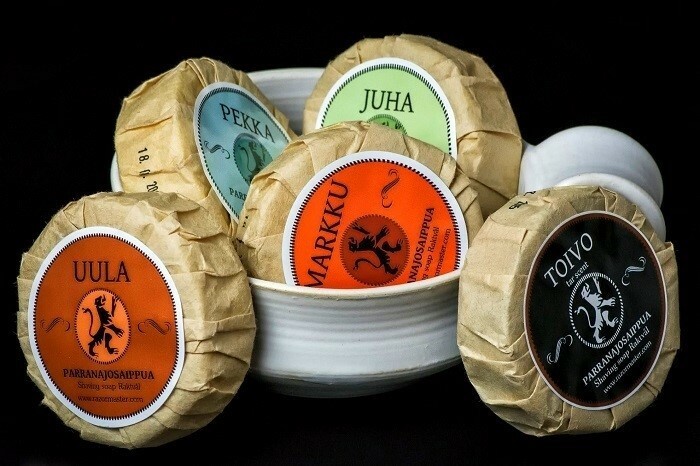 They all 5 have finish names and the scents are absolutely fantastic; “Uula” coffee, “Juha” exotic & spicy, “Markku” for whisky lovers, “Pekka” fresh & aquatic and “Toivo” pine tar scents. Toivo is the most finish scent of the range. Founder has given the name of Toivo in his grandpa honour, who at an early age used to work at the Finish Region of Kainuu on pine tar. The scents reminds me those the scent of ash from wood in a cold winter. These shaving soaps are not 100% hard soaps like British ones for instance but more similar to Italian soaps cream. If you press strongly with your fingers on these soaps you deform them.